The Gupta period ushered the golden age of Indian civilization from 320 to 550 AD – a period when art, literature, and science flourished like never before. The actual beginning of the Gupta period can be seen held from 320 AD when Chandgragupta I, the third in line of the Gupta dynasty ascended the throne. He started conquering neighbouring villages till the time his son, Sanudragupta ascended the throne. Samudragupta not only conquered most of India but is also said to found a new capital city, Pataliputra. He was himself a poet, musician and a great philosopher and invited various writers and artists to his court. Though he himself was a strong follower of Hinduism, he was tolerant towards all religions. Samudragupta was succeeded by Chandragupta II also known as Chandragupta the Great during whose rule, the empire reached its zenith. Ujjain was the new capital of Chandragupta II. Drama and poetry flourished during his rule and Nine Gems were presen t in his court. One of the most noted poets in his court and of Sanskrit literature was Kalidasa. Hindu arts also reached great heights with carved paintings in Ajanta Caves. 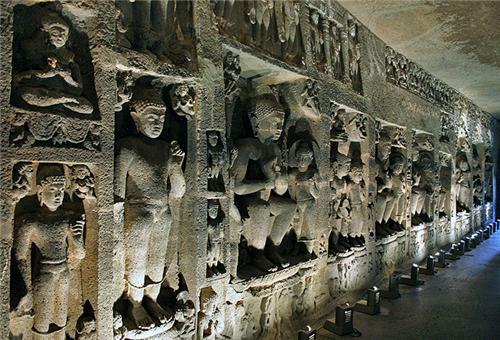 The Ajanta Caves are decorated with Buddha’s various stages of life is a classic example of Gupta’s art at its peak. Aryabhatta, the great mathematician also lived during the reign of Chandragupta II. He developed the concept of zero and even deciphered that the Earth revolved round its axis. Sushruta Samhita, one of the greatest works on surgery and medicine was written during this time. The Gupta Empire started declining after the death of Chandragupta II. The Huns who were attacking the Roman empire at the same time invaded India around 500 AD and overthrew the Gupta Empire. Nalanda University was founded during the Gupta rule. 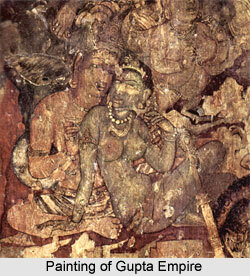 Cave paintings depicting life of Buddha at Ajanta Caves were done mostly during the Gupta period. Paintings at Sarnath Buddha, the Deogarh Dashavatara Temple panels and the Udaygiri Varaha Cave are also fine examples of Gupta art. Poets like Kalidasa, Bharavi, Visakhadatta and Dandi belonged to this period. Mathematicians Aryabhatta and Varahamira belong to this age. Famous books on science and mathematics and medicine were written during this time.